This recipe from Juice Generation combines two of the most popular superfoods. Vegan diets are super popular right now. So are juice bars. That said, it makes sense that one of New York City’s most popular juice bars, Juice Generation, is bringing in new vegan lunch offerings. It’s all part of their brand new “Vegan 4 Lunch” movement, the ethos of which is: “eat one locally sourced, plant-based meal per day, and in so doing, vastly increase your daily intake of fruits and vegetables—all naturally low in in saturated fats, calories, and cholesterol—and simultaneously decrease the demand for meat products, which takes a serious toll on the environment.” If you want to join the movement but don’t live in NYC (or just prefer to cook your own food), we’ve got a recipe for one of their tastiest sounding eats on the new menu. Check out the video above and read below for ingredients and further instructions. 1. Place tokyo turnips, chopped kale, fresh fava beans, parsley, mint, dill, sesame seeds, poppy seeds, and cooked quinoa in a food processor. Pulse until combined. Add salt and pepper to taste. 2. Portion into 3.5 oz. 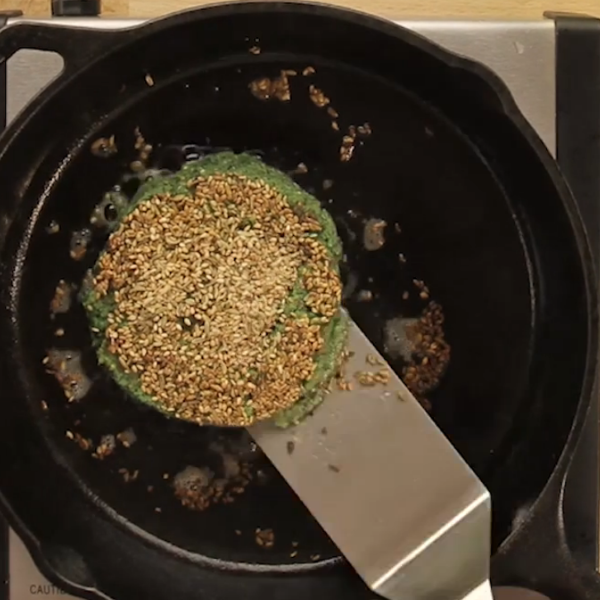 patties, then press sesame seeds into the top and bottom of burger patty. Sear both sides. 3. Blend tahini, vegenaise®, poppy seeds, black pepper, and lemon juice, and whisk together by hand. 4. Assemble on a bed of bibb lettuce with sliced beefsteak tomato, avocado, and burger. Serve poppy seed tahini on side.